I have a story in here so I am biased, but I do think the first journal by 404 Ink is a thing of beauty. 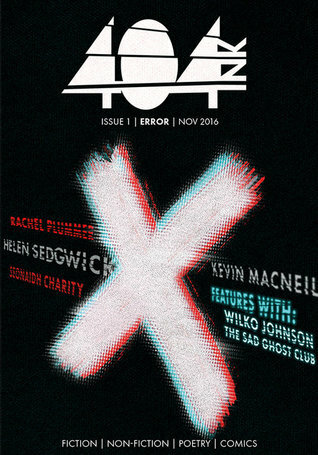 It came out in November 2016 and since then 404 have taken Scottish publishing by storm, publishing two more journals (The F-Word and Power), three books (Nasty Women, Hings and The Last Days Of James Scythe) and a couple of chapbooks. But this is where they started, and it’s a high quality production. The overarching theme of Error for me is SF, space, and glitches in the matrix. Stories like The Universe Factory by Chris McQueer, Reboot by Nicholas J. Parr, and Planet of the Daves by Jonathan Macho feel a bit Douglas Adams-y, which is right up my street. Then you have pieces that are a little more serious, characters feeling angry or disconnected and trying to make sense of things as in The Glitch by Christina Neuwirth and The Largest Circle by Helen Sedgwick. There are some great opening lines: ‘Firstly, do not patronise the stars. They are older and wiser than you.’ writes Elizabeth Gibson in How Not to Stargaze.Sonnet 404 by Cara L McKee starts:‘The lifestyle you dreamed of cannot be found.The kids will complain and the cat will die.’‘It was the falling bodies that tipped Ron off’ is Simon Brown’s opening gambit in Try Turning it Off and then On Again.There are also comics, a couple of pieces about organisations who can help you maintain your mental health, book reviews, and an interview with Wilko Johnson. So there is a lot in here, lots of different interpretations of the Error theme, and it’s a really interesting read. Loved this.The work that the authors, poets, and essayists have done to complete this book is phenomenal. Each piece is unique and there are lots of thought provoking pieces. You should read this book! An interesting collection of poems, short stories and snippets. This literary magazine bundles various writers and was a joy to read! I like it (obviously). These are some brilliant writers.